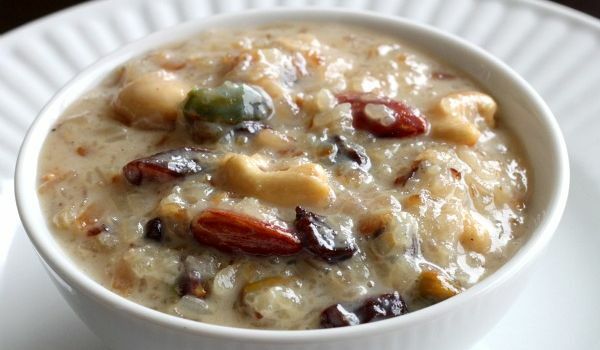 Aval Payasam is a dessert made during the festive occasion of Ugadi in Southern Indian. Flattened rice or poha is cooked in milk and variety of dry fruits are also used in the preparation. Wash and drain the poha. Leave it aside for 10 minutes. Separate poha grains with your finger. Boil the milk in a large vessel. When milk starts boiling, add poha and stir gently. Simmer till milk volume reduces to half. Stir occasionally. Now add sugar and cardamom. Stir to dissolve. Add raisins and cashews. Simmer for 2 more minutes. I tried this today.. the 1:4 measure for sugar is way too sweet for me) I think a 1:1.5 would work better.. this is for those who think a bit less it better than a bit more :) Otherwise, very simple.. very tasty recipe.